While others were celebrating the holiday some of our volunteers were giving back. Early in the morning following Christmas Day, volunteers from Thomas Edison High School in NY visited their senior home to distribute snowflakes to the seniors. It's so very inspiring to see our volunteers go above and beyond their makeovers and provide lonely women and men in senior homes compassion and companionship. Here's the story from a volunteer at Thomas Edison High School. 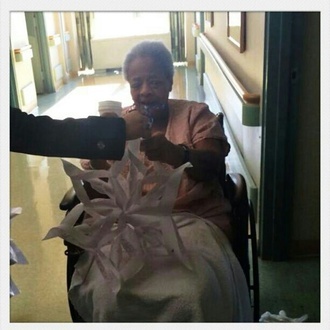 "On December 26, 2015, we visited the elderly in Margaret Tietz Nursing and Rehabilitation Center. We brought along with us handmade snowflakes to give to them, mostly to lighten up their mood and decorate their room. We gave our first snowflake to a woman sitting in the lobby, she smiled and thanked us, this refreshed us. We then went to the other rooms on different floors, where we put some snowflakes on the windows, some on the walls, and others we just handed out. Everyone we met was very happy and pleased that we were visiting. We took pictures with them and stood a while to talk with them. It was a beautiful and memorable experience."